Ironing Board Only! Reduced $100 due to overstock in New Jersey warehouse. Optional Hi Steam MVP35 or SVP24 steam boiler irons shown, under Recommended Accessories below. This Board is intended for Light Duty Commercial use. Self-contained vacuum ironing board in a simple design saves space and time. 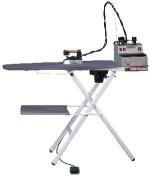 Large ironing surface up to 55" x 15" results in faster productivity. Folding legs allows you to adjust height of ironing board. Dark colored ironing cover resists stain and discoloration due to heavy use. Made of durable aluminum that is rust-proof. Front rocker switch turns on power. Included foot pedal controls vacuum suction like a third hand. Secondary stand holds iron and other ironing supplies while not in use. Iron Rest Platform on Right and Garment Catch Tray Underneath. This ironing board is great - I love it - makes ironing go much faster and final results are much better. 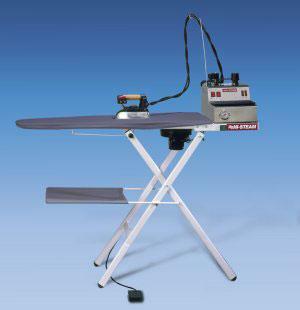 For anyone who does a lot of ironing - it is a very good investment. Everything was excellent. I will give a very good references on you. Marcel, Cirque du Soleil Inc. Montreal.